Responding to the needs of those we care for daily. 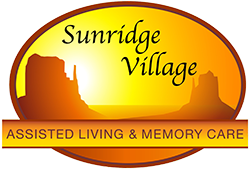 Sunridge Village takes great pride in our mission offering a range of assisted living and memory care all in the same location. Your loved one can transition from one level to another in their home. Our approach to providing a desirable senior living option is exemplified in the quality, service and value we provide. Our commitment to you begins now, as you take these important steps to make Sunridge Village your new home. We are dedicated to providing you with quality services and accommodations in Assisted Living and Memory Care that enable you to live life to the fullest, in a manner that best suits your interests and desires. Our community is designed with our residents in mind we provide services and amenities for our residents to remain independent and active to the best of their ability. We are dedicated to providing the best possible quality of life to each of our residents. Please email or call our Community Relations Director to schedule a tour. Please check back later for news content. Please check back later for events.